View More In Vocal Effects Processors. 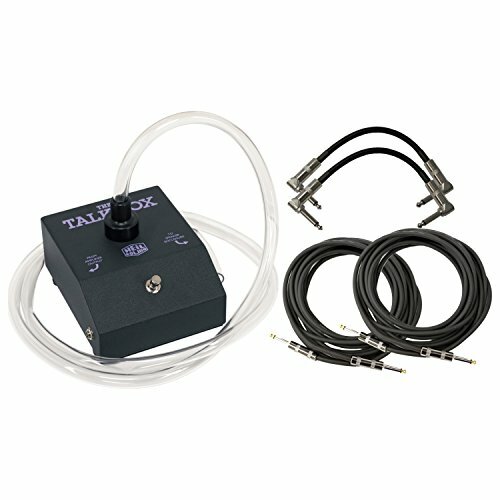 Save with this Bundle:Dunlop Heil HT-1 Talkbox w/ 4 Cables DUNLOP HT-1 HEIL TALKBOX This unique and famous effect was popularized by Peter Frampton, Joe Walsh, Aerosmith, Bon Jovi, and others. The sturdy metal casing houses a phenolic diaphragm speaker, powered by your amplifier's external speaker jack. Strukture S6P48 R-Angle Patch Cable, 48pc. We selected the top-selling cables in the industry and eliminated as much packaging cost as possible without sacrificing quality. The rubber outer covering is reinforced by a state-of-the-art shrink-wrap sleeve to resist separation at the termination points. Strukture SC10W - 10ft Instrument Cable, 6mm Woven We selected the top selling cables in the industry and eliminated as much packaging cost as possible without sacrificing quality. The woven outer covering is reinforced by a state of the art shrink wrap sleeve to resist separation at the termination points. Famous effect popularized by Peter Frampton, Joe Walsh, Aerosmith, Bon Jovi, and others. Produce that unique talking guitar sound. If you have any questions about this product by Dunlop, contact us by completing and submitting the form below. If you are looking for a specif part number, please include it with your message.